03-Aug-2003 -- The story begins with our marriage in March 2003. A friend in the United States of America, Joby Lafky (of 1N 104E, 47N 120W, 35N 6W, 37N 8W (incomplete) fame) sent us a GPS unit, with tacit confluence hunting intent, as a wedding present, to our immense satisfaction. An issue of distress to us, however, was the fact that the gift arrived shortly after we returned from our honeymoon, spent within kilometres of a free Confluence, the very Confluence we subsequently visited, which adventure is reported below. We left Cape Town at 09h00 on a rather dismally overcast morning, Sunday 3 August 2003. Our expectation was that it would take about three hours to drive to our destination, so we settled down to a long morning's driving. The N7 national road leads north out of Cape Town, paralleling the West coast, although quite some distance from it. The road passes through the country towns of Malmesbury and Piketberg, passing close to Citrusdal, where a lot of the fruit that South Africa sends all over the world is grown. Eventually we turned off at Clanwilliam north of the Clanwilliam dam, into the Cedarberg. 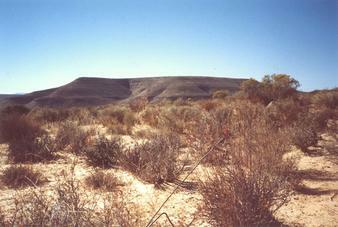 The Cedarberg Wilderness Area is a popular camping and hiking area for many South Africans, and parts of it have played a role in South African history, both in being a meeting area for one of the groups involved in the Boer War, and for its abundance of rock paintings thousands of years old. It is a wild and beautiful region where one feels very far from the hubbub of city life. We had some detailed maps of the region that allowed us to find back roads leading us almost to the very point of the Confluence. Ignored by the occasional herd of hardy sheep, we managed to get within approximately one kilometre of the Confluence. We abandoned our car at the side of the road, hoping that the sheep wouldn't steal it, and headed off into the bush. One member of the party, with a healthy fear of snakes and scorpions, made sure to step quite loudly to give local wildlife a sporting chance to get away, while the other member of the party thought she was quite unreasonable. Sound carried incredibly clearly in the still, cool air, and we could hear sheep that were mere dots on the landscape far away. We had to climb a small hill to get where we wanted to be, but it was nothing strenuous. The three sheep on the other side were startled to come face to face with humans, but everyone stayed calm. Finding the Confluence was unproblematic and we happily took pictures in all directions. Unfortunately, our pictures of the GPS unit had the focus in the wrong place (next time we'll put the unit on the ground), so it is impossible to see what our accuracy was, although we recall it was 16 feet (5 m). We scrambled our way back to the car, which, to our relief, had gone unnoticed by the sheep, and headed off. We stopped at the Clanwilliam Dam to have a much needed picnic, then made our way back home to Cape Town, happily satisfied that we had made a good start on our road to overtaking Joby in Confluences reached. Now we gaze over our free Confluence rich African landscape choosing which one to visit next.